Photo DVD Slideshow Pro. can create entertaining photo slideshows you can watch on TV, create Flash slideshow (FlV) perfect for posting online to your website, generate MPEG video files for mobile devices such as Apple iPod, Sony PSP, cellular phone, build photo slideshow video ready for upload to YouTube, MySpace. With few clicks, DVD Photo Slideshow creates an exciting photo slide show with music, DVD menu, Pan&Zoom and transition effects. Create entertaining photo slideshows for TV, PC, iPod, Zune, PSP, Website. ...... CD or DVD menu, Pan&Zoom and transition effects. Photo DVD Slideshow supports DVD, SVCD and VCD 2.0, MPEG, MPEG-4, FLV (Flash for Video) as the output format, supports over 360 amazing transition effects, Pan & Zoom, anti-flickering filter, supports adding background music directly from music CD and adding text Macro such as photo album name, photo file name, date, etc. Photo DVD Slideshow Professional supports sub-title and art clips for each photo slide which adds amazing special effects for the slideshow. 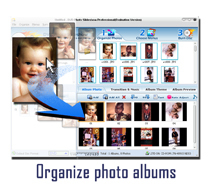 Photo DVD Slideshow Professional also supports voice recording, annotation, audio music trimming and timeline control for easier audio/photo synchronization. Qweas is providing links to Photo DVD Slideshow Professional 8.32 as a courtesy, and makes no representations regarding Photo DVD Slideshow Professional or any other applications or any information related thereto. Any questions, complaints or claims regarding this application Photo DVD Slideshow Professional 8.32 must be directed to the appropriate software vendor. You may click the publisher link of Photo DVD Slideshow Professional on the top of this page to get more details about the vendor.